Last Saturday, Dave and I bought our one-way tickets from Boston to Prague and reserved a space for Smudge on the plane. It’s official! On April 13, we become expats. You guys, we are really moving to Prague. Although this might be surprising news to some of you, this is an adventure that’s been in the works since about 2010. We’d visited Prague and fallen in love with the city and the lifestyle it offers, but I was working at a full-time, corporate job, and we owned a house in Austin. Getting from Texas to Europe in a permanent way seemed like an impossible daydream. But Dave had read The 4-Hour Work Week by Timothy Ferriss, and he had ideas. We spent our Saturday morning breakfasts brainstorming and hoping, and we eventually developed a plan that would allow us to be geographically independent. As we always do when we have a big project to manage, we sat at our dining room table with a roll of kraft paper and drew a timeline of every step in the process (along with questions, fears, hopes, and challenges). The first milestone on the map was to write and release a cookbook; that intention became Well Fed. Within three months of its release, I was able to resign from my full-time job to concentrate on building our business—all with the goal of eventually cutting our ties to one physical location. 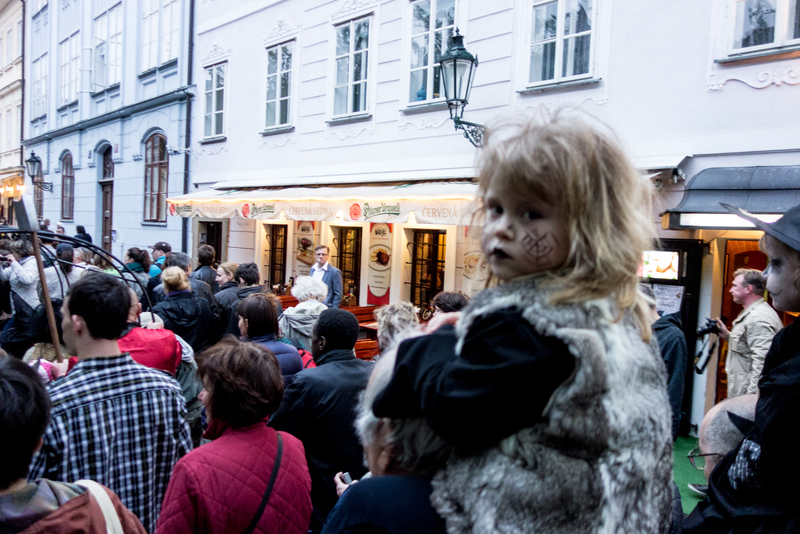 By 2013, we’d written and produced Well Fed 2—and we’d visited Prague two more times “just to make sure we really want to move there.” We were ready to pull the trigger and start the moving process when fate intervened. Dave—who’s been devoted to reading comics and understanding comics and wanting to draw comics for the 25 years that I’ve known him—learned about a week-long summer program at the Center for Cartoon Studies in White River Junction, Vermont. During the summer of 2014, he spent a week working on comics full time and came home with an intriguing idea: What if we took a two-year detour to Vermont before going to Prague? Our “move to Prague” plan expanded to include Dave becoming a Master of Cartooning and the production of another new cookbook—Well Fed Weeknights. And now, here, in January of 2017, every step on that original kraft paper map from 2011 has been completed. Now we have a new kraft paper plan with to-do items, questions, fears, hopes, and challenges for the physical move to Prague. We’ve compiled epic lists of furniture to sell, people to visit, questions to answer (Thanks to a blog reader, I know where to find coconut aminos in Prague! ), and—most importantly—things we want to do when we get there. 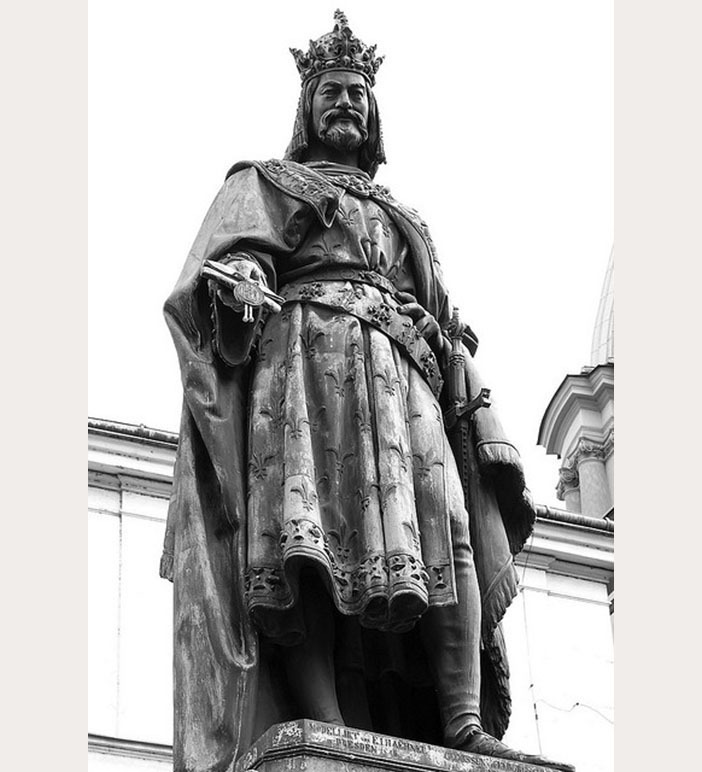 I like to pretend that this statue of Charles IV, King of Bohemia and Holy Roman Emperor, is personally welcoming us with his kind eyes and benign smile. 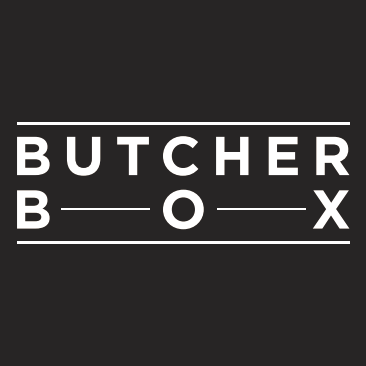 Will this blog continue with recipes and stories? Yes! This site will continue on. I’m sure I’ll share recipes inspired by our travels and ingredients readily available in our new home. Dave and I are also talking about collaborating on a new site where we’ll share our European adventures, but it’s still very new, so too soon to talk specifics. Is Smudge going to Prague, too? Absolutely. Even though she’s selfish with her love and she loathes spending time in her travel case, Smudge is making the trip with us. We flew with her in the cabin of the plane when we moved from Austin to Vermont, and she was miserable, but after a few days, she forgave us. There are plenty of practical reasons we chose Prague: It’s a beautiful city that’s centrally located for easy travel to other exciting destinations. The city is served by an awesome public transportation system. It’s still reasonably affordable. But those facts don’t get to the heart of why we’re moving there. We didn’t really choose Prague so much as we feel drawn there. Some places you visit make you think, “This is fun! I like it here! What an awesome trip!” but it doesn’t feel like home, and you don’t feel compelled to move there. You visit, enjoy it, and happily head home. Prague wasn’t like that for us. We definitely thought, “This is fun! I like it here! What an awesome trip!” But we also felt something. And the knowledge slowly worked its way into our consciousness: We should live here. Once that emotion flickered, it stuck. And now I will try to convey why. 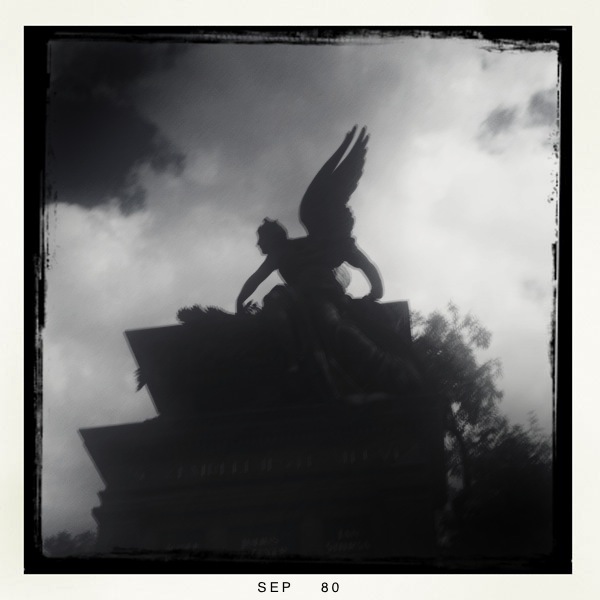 … and the way, if you catch the light just right, beautiful things are also a little threatening. 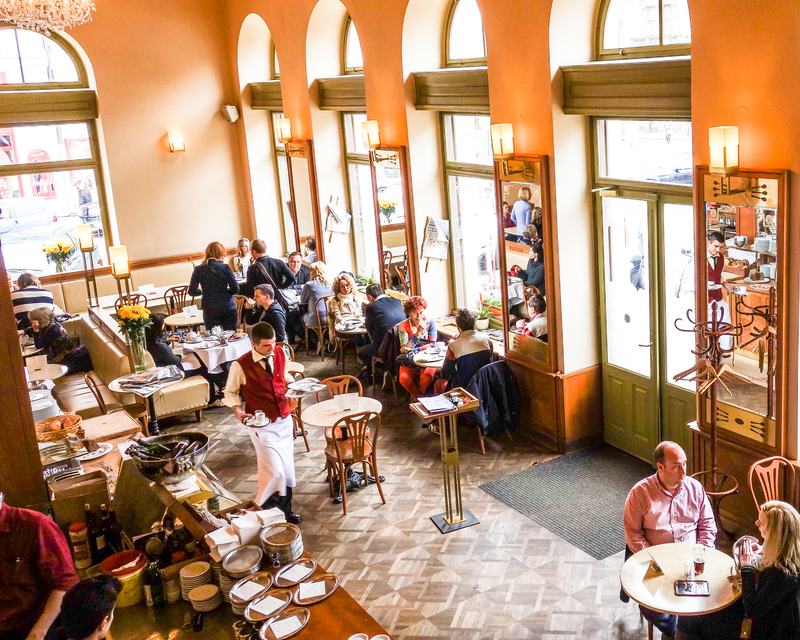 This is a photo one of my favorite cafés: Týnská literární kavárna, and one of the reasons why it’s a favorite is in the name. It’s a literary café. I wrote a few blog posts there once, and I can tell you, the atmosphere is just right for thinking and creating. But then, there are days when the sun is glorious and the city is the ideal playground for a run around castle walls, up the stairs at Letna Park, or to use a workout as a political statement. And views like this make me feel like there are helium balloons inside my chest, lifting my heart. There’s music everywhere. Classical music that floats in the air of an art deco theater or lingers in the rafters of a historic synagogue. 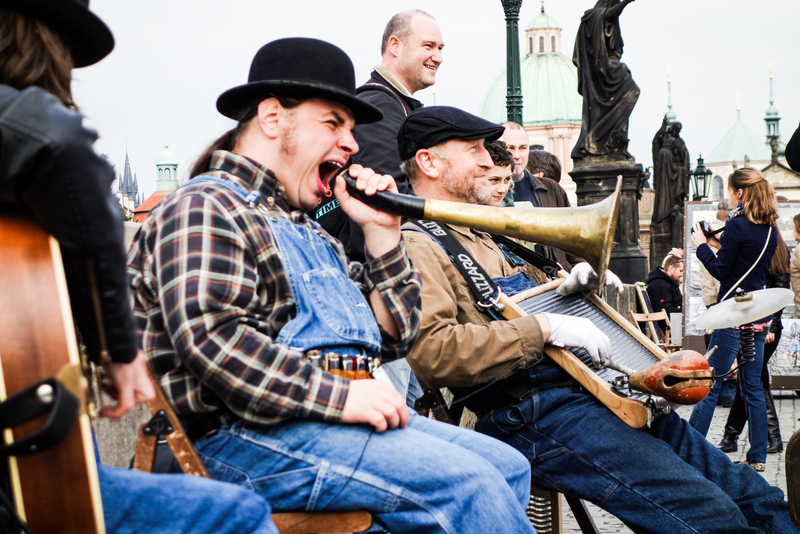 Exuberant klezmer music literally has people dancing in the streets, and this band regularly plays jump blues on the Charles Bridge. 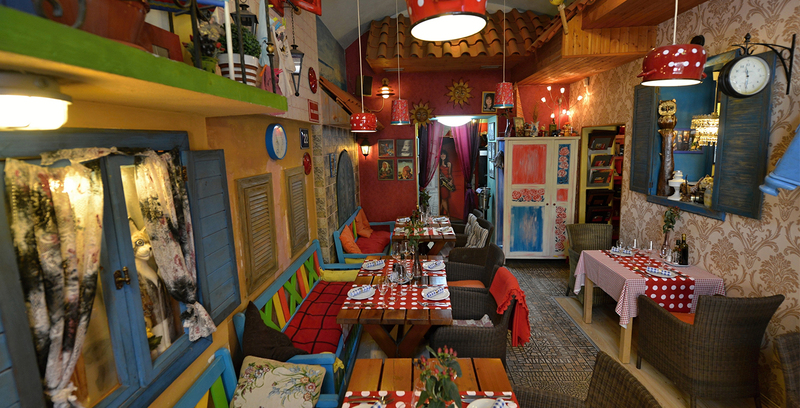 Or the playful Balkan restaurant Luka Lu where we ate ćevapčići for the first time. 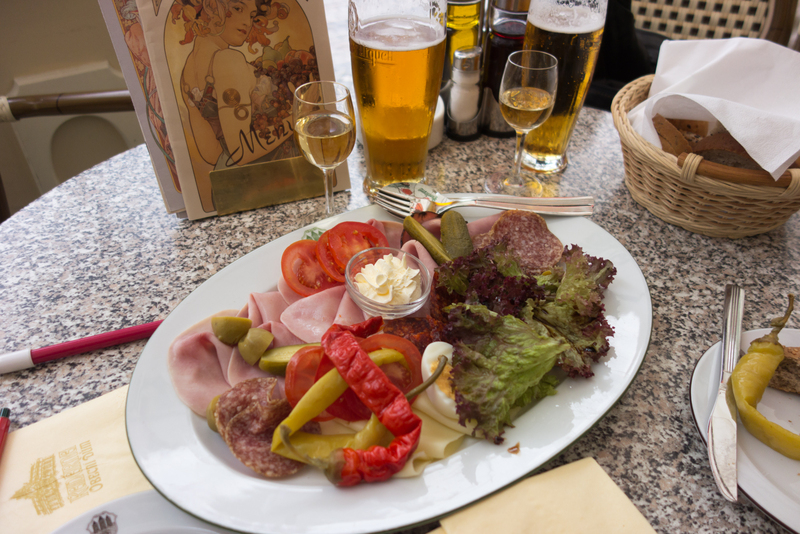 Most pubs and cafés have my favorite kind of lunch, and I learned on one of our trips that it’s not too hard to shop and cook paleo in Prague. 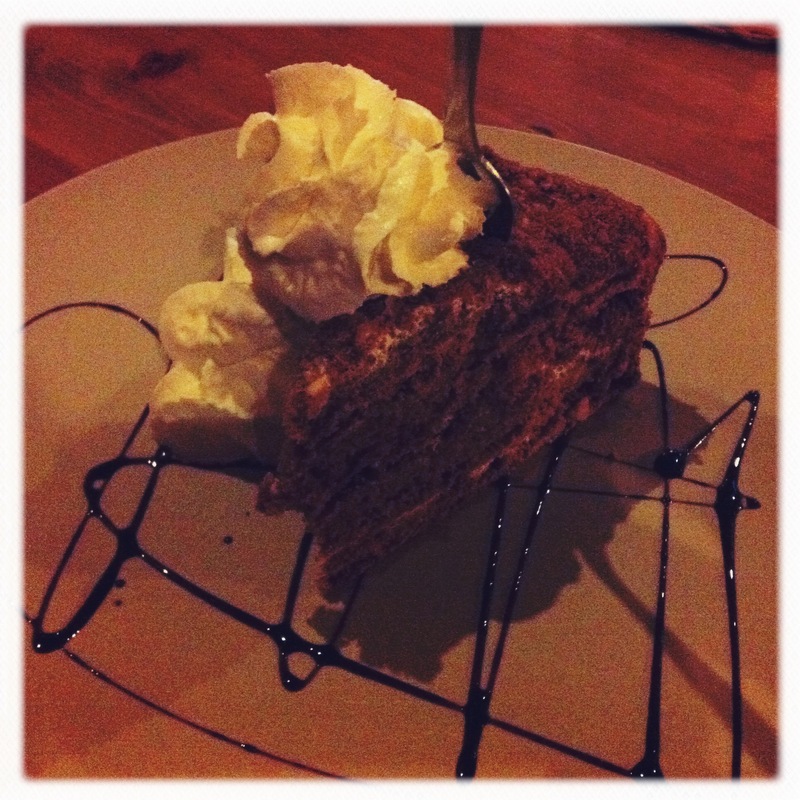 And when we’re feeling like a treat, Dave always picks honey cake. 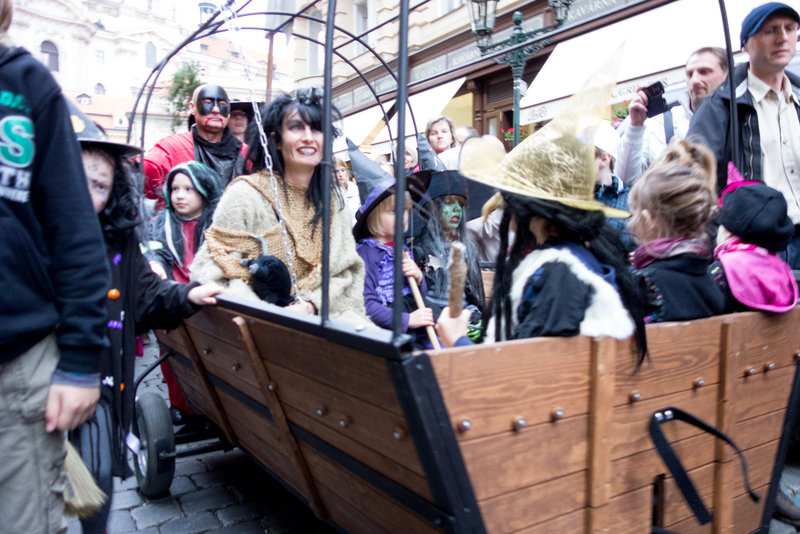 … and the children were collected in a cart that crossed the Charles Bridge to Kampa Island. Note the disdain this wee witch had for Dave. I found this hat at a costume shop in Prague (Karneval Ptákoviny) and brought it back to the US with me—and now it will make the reverse trip in my suitcase again. 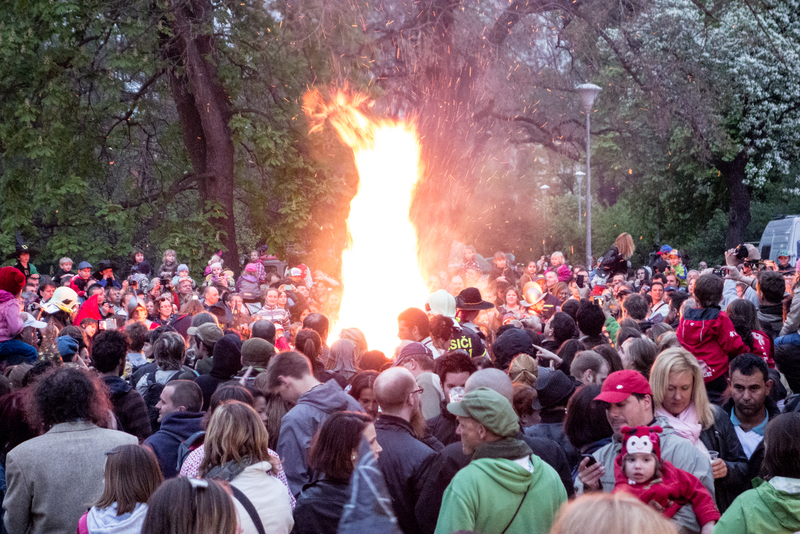 The parade of witches culminated in a big bonfire where we danced to a klezmer band, ate sausages, drank beer, and celebrated until midnight when it officially became my birthday. 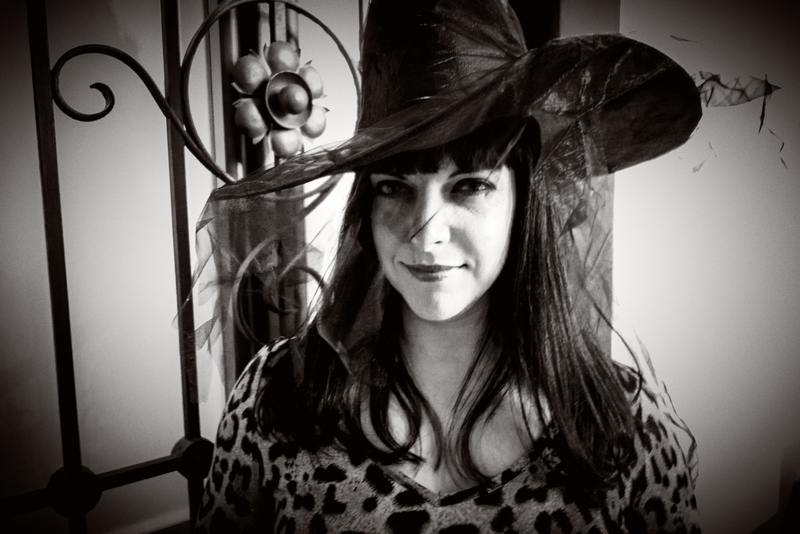 We’re timing our arrival to Prague this year so we’ll be settled in plenty of time for Witch’s Night and our dear friend Tillie will be our first house guest! You can read more about our previous adventures in Prague here. I am thrilled for you! How exciting and wonderful and I can’t wait to hear about your adventures, whether here or on another blog. Thank you, Lydia! You should come visit. The last time I traveled to Europe, I got detained for two hours in Munich and they confiscated my passport. It might be a while before I attempt international travel again, but if I decide to risk it, I’ll let you know! What an awesome plan! I read how you and Dave started this out in 2010. I liked the idea about the timeline so much that I shared it with my wife. You and Dave are people of “DO.” I wish I had your adventurous spirit. 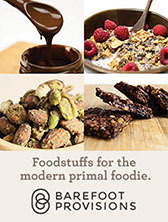 I have three of your books and appreciate your effort at making Paleo accessible for those of us who need the change. Keep up the good work. My wife and I are anxiously following your adventures. Thank you very much for buying our books and for your sweet words of support! We are very methodical and slower than we’d like, but eventually we get there 🙂 Stay in touch, and I’ll try to share some fun new recipes from our new home. Oh my goodness, Mel…what an amazing adventure! I am so happy for you and Dave, and I wish *you* all the happiness in the world. Looking forward to hearing all about your journey and new life…and to coffee in one of those little cafes if I ever make it to your new neighbourhood (perhaps for a booksigning of my own one year 😉 )! Linda, it would be awesome if you came to Prague for a book event. Let’s make that happen! Or just come for fun, and we’ll drink all the tea and eat all the goodies. you’re making me want to move to prague and i’ve never been there! best of luck to you and i’m excited to hear about your new adventures. I definitely think you should visit! It’s a magical place. Thank you for the well wishes! wow!! congrats…. this is such an adventure for you both! You are poetic!! It sounds like this is the best place to be for you. I hope to go there someday as well. Thank you for your website/blog and your books. Best wishes on your new adventure. Thank you so much! I’m glad you’re enjoying my web site, and if you make it to Prague let me know. I’ll take you out for tea! Congratulations on your new adventure! I hope you find the life that you are looking for! So exciting!! I have loved reading about your Prague adventures. It inspired me to visit last year and it was so amazing. Oh, I love that! I’m so happy you enjoyed your trip. What was your favorite thing you did? The ossuary at Kutna Hora was so fascinating. My other favourite was a very un-paleo beer and tapas tour! I wish I had more time there to explore, I’ll have to go back ? YASSSS! Congrats on fulfilling this dream! Safe travels, you three. I’m sure expat life will look stunning on you all. Thank you! It’s going to be a big adventure, for sure. I’m so excited for you! May your travels be safe and your adventures be thrilling! I’ve been watching this unfold for a long time and I am SO EXCITED for you!! I remember a couple of years ago when you were talking about how you loved Prague and would love to move there. I am so glad that things are working out for you. I am also so glad that you will continue to share your yummy recipes. Thank you! I’m pretty happy that we’ve finally made it happen. It still feels a little unreal. What an inspiration!!!! I love hearing stories of people following a dream and can’t wait to hear of your new adventure! Wow! You’re a super adventurer. I’m not sure I would have the guts to do it myself. Dave and I are a good team, and I feel super secure with him as my partner. You’re awesome! It looks like a nice plsce. Is it an eveyone smokes everywhere country? Some of the pubs are pretty smoky, but I *think* there’s a ban on smoking in restaurants. Anyone in Prague want to chime in on this? Not from Prague, but per the intarwebz the Czech Republic approved a ban on smoking in restaurants and pubs last month, to go into effect May 31. Thank you, helpful internet citizen! Wow! Such an exciting time! 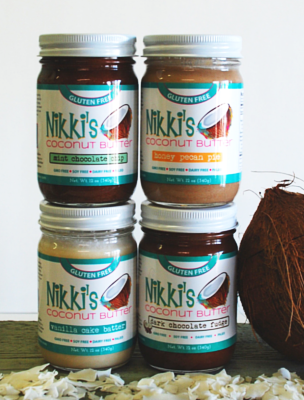 I’m really looking forward to all the delicious new treats you will be concocting… with a European flair. Thank you! Fun recipes to come! Wow! I’ve been following you since before you left Austin and this is fantastic news for you both. You never cease to be inspiring. I myself have moved from Austin to Denver and now England (with my husband)and have been here for about a year. You will learn so much about yourselves. All the best wishes and can’t wait to see what inspirational ideas you’ll come up with next! I love seeing all the stories of my blog readers who took the leap to another country. You’re making me feel much more confident about the situation. Are you having fun in England? Where are you? We live about 45 mins (by train) a little Southwest of London in Hampshire (Jane Austen) country. Sometimes I say outloud, “Wow, I live inside of a Thomas Kincaid painting.” It’s gorgeous, but what I have learned about myself is that I desire to be around creative people. I’m learning things about myself that I had no idea I needed to learn. I imagine you will have some interesting, life rewarding moments to be sure. 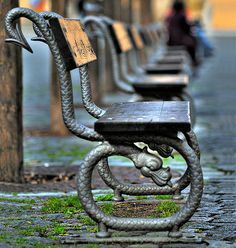 I see your photos of Prague (hoping to visit one day) and I see you have the creative piece covered. Just on a paleo note, I can’t explain it but a lot of my taste buds changed after being here and some days we just go full vegetarian. It’s hard to avoid the European deliciousness of bread and cheese and pastries here. All the new foods, it can be a challenge, but it’s a FUN challenge! That’s awesome. Thank you for sharing more of your story with us! Thank you so much! I can’t wait to get there! Hello! Are you in Prague, too? I would love to say hi! (Now maybe I seem creepy?) My great-grandmother moved to the US from Slovakia (former Czechoslovakia, of course), so I have a connection to that part of the world. Yay! You should be SO proud of yourselves for not living in the Land of No and for making your own dreams come true!!!!! Having fallen in love with Prague myself I totally get Why Prague. Was moving there your wish on the Charles Bridge? You know, I think it was! Thank you so much! I’m very excited to arrive and explore. Congratulations! I am extremely happy when someone follows their bliss and is able to live life on their own terms! Looking forward to continued greatness. On a selfish note, if you haven’t already, could you, for those of us longing to become expats, write a post about what’s involved in making the transition? Sometimes, as with lots of items, when left to our own devices, the “what it takes” process seems so daunting, and overwhelming, we end up in analysis paralysis mode forever. If you want to get started, I recommend the book “The Expat Expert.” It has tons of great advice and step-by-step plans. Both Iceland and Quebec are so charming and cosmopolitan. You can’t go wrong! This is fabulous! I love the idea of location independence and am impressed with your 7 (!!) year plan, and the perseverance to make it happen. Can you show a photo of the kraft paper timeline? Do you paste it on your wall like teams would do in a project “war room”? I was absolutely delighted when I first read about this move in your newsletter, because you have mentioned Prague quite a number of times before! I am also just a little selfishly glad, hailing from the European side of things myself (London! ), so maybe now we’ll have more recipes with ingredients that are accessible…? 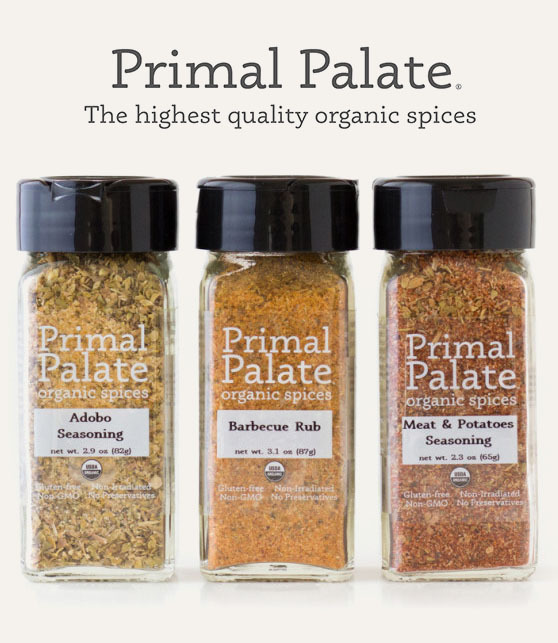 😉 I love your site and books – as I often say, between you and Michelle Tam, that’s 90% of my paleo cooking covered. I hope the moving goes smoothly, and may it be as stress-free as possible. Looking forward to hearing of more of your adventures! I used your recipes as my guideline when going through my first Whole30 in 2012 and have (silently) leaned on you as a resource since then. I’m thrilled for you, and this exciting move, and I wish you the very best! I’m very happy that my recipes have been helpful with your Whole30 pursuits. Thank you so much for sharing our excitement. Sounds like you’re an adventurer. That’s awesome! We are very plodding, methodical, wannabe-adventurers 🙂 Are you still in Bavaria? Where are you off to next? I LOVE Berlin. Our friend is going to be there this summer, and I’m excited to visit her. You’re a lucky ducky! This is very exciting. We lived abroad for 7 years and it was such a life changing adventure.I recommend the experience to everyone! With expat living the highs are higher and the lows are lower. It’s just more intense on both fronts. I’m curious though what visa scheme are y’all are using to relocate? We’re pretty sure we’re going to get a Czech trade license, then proceed from there. We have a company in Prague that’s helping with all the paperwork and admin stuff. Thanks for the vote of confidence! We’re excited, but it’s a little scary, too. I’ve never even seen anything from you till today on Whole30Recipes, which led me here…… and I’m SO excited for you, a total stranger to me! I adore Europe and wish I could live there sometime too! What a wonderful adventure – enjoy enjoy enjoy!!! Can’t wait to see more of your adventure! I’m so happy the Whole30 brought you to my site. Welcome to my group of happy eaters! Oh my gosh!! 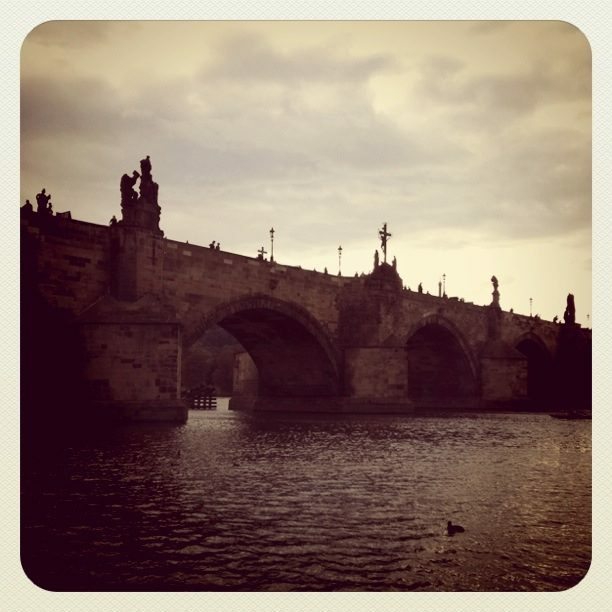 Prague is one of my favorite cities ever! I’m so excited for you to embark on this new adventure and I look forward to hearing about life in Prague! Thank you for being excited with us! We definitely want to visit Brno! The publishers who put our the Czech version of ‘Well Fed’ live there, and it looks like such a pretty city. Looking forward to reading about your adventures in Europe! Safe, wonderful and tastie travels! I look forward to sharing our adventures 🙂 Thanks for following along! OMG I want to move to another country now too! I was teared up by the end of this post. What a beautiful love letter to a great city. I’m so excited for you and can’t wait to read everything about it. Thanks so much for being excited with us! It’s pretty fun (and scary but mostly fun). Just purged my hoodies and workout clothes. How many black tanks is too many?! I have been such a huge fan of you for yeeeeears, your recipes were my gateway drug into the paleo world, and I am so stoked on your success! You’re such a boss, congrats on living the dream! You’re so nice! Thanks for being with me all along! And for sharing our excitement at our next big adventure. Prague was my favorite stop during my time in Europe and I hit just about everywhere. I was there in 1992, a long time ago, but right after the wall came down. 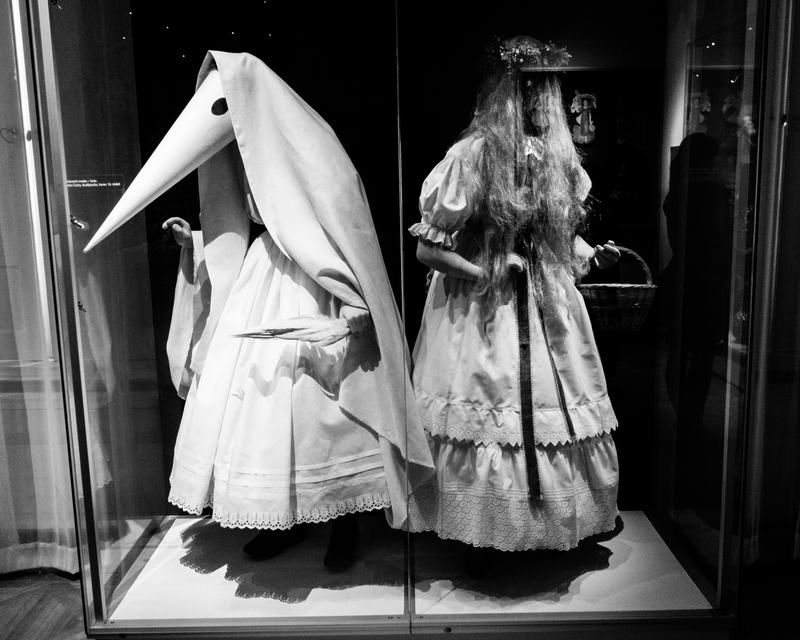 It was a fascinating place and there is something very special about it. Good luck and enjoy! That must have been such an amazing time to visit Prague. I’m sorry we missed that era! We didn’t get there for the first time until 2010… I love hearing stories about the early days of freedom. Lucky you! So happy to see our Prague paleo world is getting you guys! 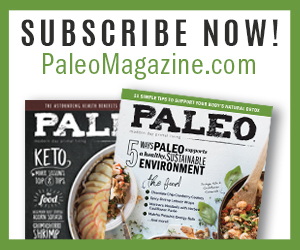 If you will need any tips on where to buy paleo staples, or just some good whole foods -I am here. Good luck with all the preparations! ? Thank you, Jelena! I would love to meet you 🙂 Always nice to see a friendly face. Good luck with your new venture. I moved to Spain nearly 12 years ago now with my husband and daughter (who has now returned to the UK). I couldn’t imagine living anywhere else now. Not only great weather, but also lovely people and fantastic food. 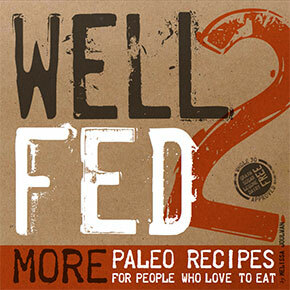 Love WELLFED2! 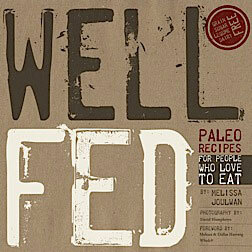 Just bought wellfedweekends. I’m glad you are following your dream. I left the USA in 1974. Fulbright teacher exchange program. Taught in international schools all over the world. Married a Dutch man. Spent 24 years in Holland. We retired to Provence in France in 1999. I am 70. I love life in my medieval village of Les Arcs sur Argens, surrounded by vineyards and olive groves. I fly back to the states once a year to see friends and family. 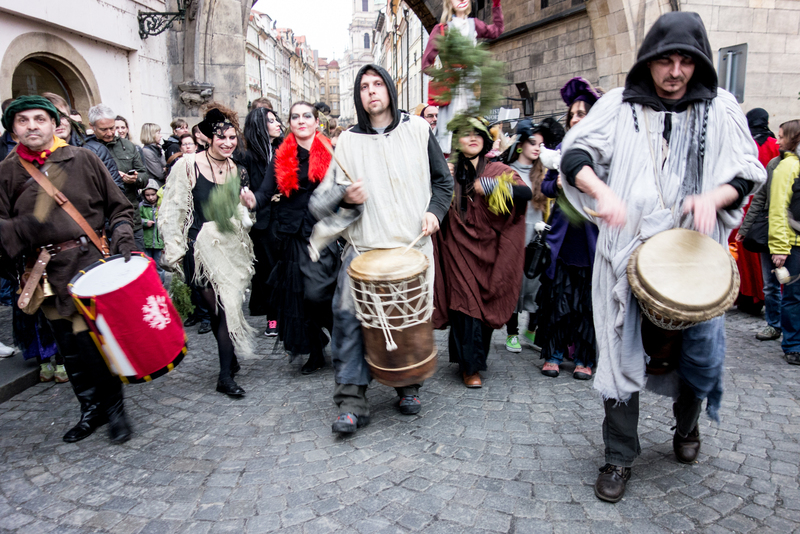 Expect you will thrive in Prague. Hope to keep learning through your blog. Best wishes for your health and happiness. Thank you. Thank you for buying our new cookbook! And thanks for sharing your story. I think we’re going to love our adventures. I have just recently started following you and your upcoming move to Prague sounds awesome! You and Dave are very adventurous!! Good luck, I wish you all the best! Thank you so much! 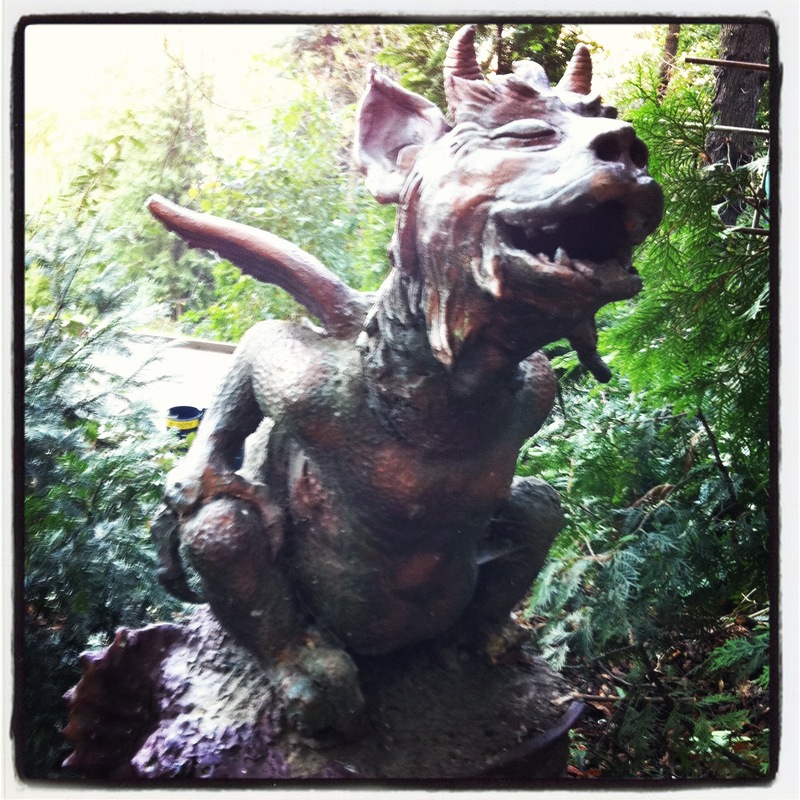 Hope you’ll follow my blog and join us (virtually) on our adventures! You (and Dave and Smudge ;-)) continue to be such an inspiration. I can’t imagine having embarked on my “food/health journey” without your cookbooks and blog. I’ve been following for a couple of years now, since the first Well Fed…and now THIS!! So happy for you guys and grateful for the insight – bigger than food (which is pretty huge). Thank you for being you and sharing – best wishes on your transition! My husband and I made the move out of the US 3 years ago, first to Chile now in Ireland. Wish we had done it sooner! Enjoy every moment of expat life and exploring your new home. Thank you so much! Always awesome to hear from another adventurer! What a lovely and exciting new chapter!! Prague stole my heart when I found myself enjoying the “river walk” -surrounded by the coffee/beer nooks, boats, and the incredible ease of getting around. And the food!!! You guys will be brilliant in Prague! I think Prague has a way of stealing hearts on a regular basis. It’s very… alluring. The other thing that helped me adapt to the idea was reading memoirs of other people who’d lived abroad. Even when the writing wasn’t awesome, it was still helpful to see that it’s do-able, and things will go wrong, but you figure it out. I have had Well Fed 1 and 2 since their respective releases and they are definite two of my go-to cookbooks. My daughter graduated from high school this past year and since she was I little girl she and I had planned to visit Europe as her graduation gift. We planed the bulk of the time in our motherland, Poland, but also visited Budapest, Vienna, Prague, Riga and Vilnius. Poland holds a very special place in my heart, especially the Krakow area, as my mother’s family is from there, but outside of that, Prague was my favorite city by far. The rich history, the vibrant colors and the amazingly preserved architecture all woven together to create a perfect tapestry. The people were friendly, the food and drink is fantastic. There is so much to do and see. We didn’t have nearly enough time to explore it all and I look forward to the day I can return and spend more than the three days we had allocated there. Good luck on your adventure! I admire your spirit and am more than a wee bit jealous :). Cheers! If you get back to Prague in the next few years, definitely let me know you’re coming! I’m SO looking forward to visiting Poland myself. It’s at the top of my must-visit list. History, food, architecture… can’t wait! Here’s to making dreams come true! I can’t tell you how excited I am for you and Dave and Smudge!! I have been following you since your first Book was given to me as a gift. You were part of my husband’s and my “start to clean eating”. Many of your recipes are daily staples in our home such as your home made olive oil mayo. 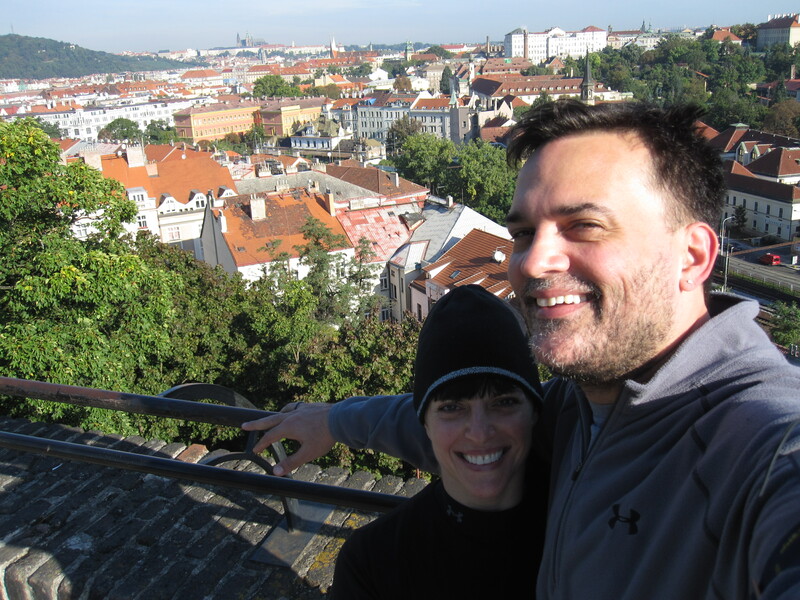 My husband and I were fortunate to visit Prague in 2012 and it is truly one of our favorite places in the World. While visiting there I had the best cup of Tea I have ever had and it was at Cafe Savoy where they have a Tea Menu!! If you have not been there in your many visits, I highly recommend it!! We lived out of the Country for almost 4 years and I Cherish the experiences and the memories. You are going to love this amazing adventure. I LOVE the Cafe Savoy. In fact, we’re looking at an apartment that’s right around the corner from there because it’s one of Dave’s favorite places on the planet. 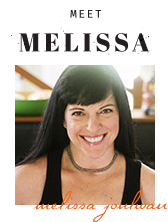 Hi Melissa – I am so excited for my imaginary internet friend (of course your real…but I imagine you cooking your recipes along with me and us getting along like a house on fire). My hubby and I live in the U.K. But we too have fallen in love with the Czech Republic. We’ve not made it to Prague yet, but we adore Brno and have been several times. Like you, we love the culture, the food and the endless possibilities of life there. 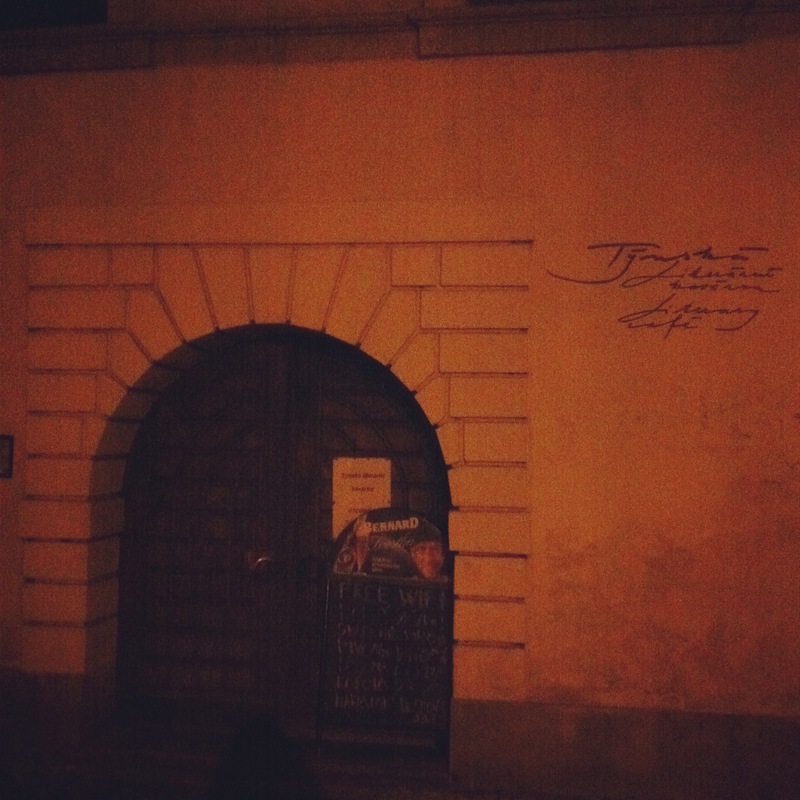 If you do make it to Brno please, please, please visit a restaurant called Borgo Agnese and try their tasting menu…honestly I would fly to Brno just to eat there. I wish you every happiness in your big adventure. Thank you for the restaurant recommendation! We will definitely try it! Brno is on our visit list… our Czech publisher is based there, and we want to visit them and check out the city. Let me know if you come to Prague! Such a great story! Sad to lose a fellow Vermonter, although we also dream of a 4 hour workweek life. Please keep us posted about your journey. You will be pleased to hear that I got my first cookbook of yours from our local library. It was so “well used” I had to buy a new copy for them, and I’ve been on your bandwagon ever since- thank you! CONGRATULATIONS on this newest adventure! 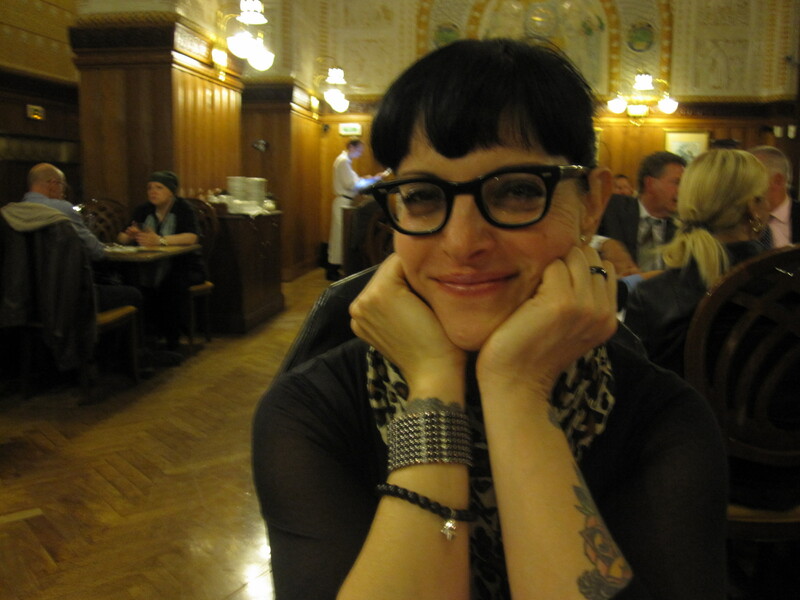 I remember reading your blog when you were here in Austin, and Prague was your dream city. I’m SO SO happy that you have achieved this! I hope that you guys have a wonderful, wonderful time in your new home! Thank you for being excited with us! Can’t wait to see what happens as we settle into our new home! I saw this article back in January but just went back to read it a few days ago. I think it’s absolutely WONDERFUL that you are able to pursue your dream to move to a foreign city and live your adventure! This reminded me of my moves to Italy and Venezuela and for a while, I revived the adventurous side of me — which I miss terribly! I wish you, Dave and Smudge the BEST and thank you very much for all your WONDERFUL recipes! I make them on a weekly basis and I just love them! I am SUPER excited about making recipes from the area and venturing out right along with you (in my kitchen). You have also piqued my interest in traveling to Prague! How does it get any better than this! Thank you, thank you, thank you! I appreciate and acknowledge you for all your contribution to my culinary skills and my taste buds are thrilled with your food as well! DEFINITELY visit Prague; you’ll fall in love with it.